Pump up your chest in minutes with our T-shirt-filling finisher, aptly named a pressing matter. Your upper body won’t know what’s hit it! This EMOM (every minute, on the minute) session will work you hard for 15 minutes. Have you ever wondered what the absolute best muscle-building movements for your chest are? Wonder no more! Here are our top 3 pec-building picks. This isn’t a list of the hardest chest exercises. It’s focused on the best-of-the-best mass builders, with a little bit of instruction and explanation to complement each choice. You can swap exercises in your current routine for these choices, build your own chest workout with a handful of them, or just try one when your standard chest workout gets stale. At the start of the first minute, perform five incline dumbbell presses; in the second, do 10 dumbbell floor presses; in minute three, perform 15 bench dips. Complete this sequence five times. Set up on a bench at a 45-degree incline and hold the weights above your chest, with your arms extended. Focus on your tempo by lowering the weights for five seconds, pause, then explode up, squeezing your pecs hard at the top. Get your rest in before the minute is up. Take the same weights from your incline press and lie flat with your elbows on the ground and your upper arms at 90 degrees to your torso. Press the dumbbells up as fast as you can and lower for three seconds. The shorter range of motion allows you to keep pushing when you start to tire towards the end of the workout. 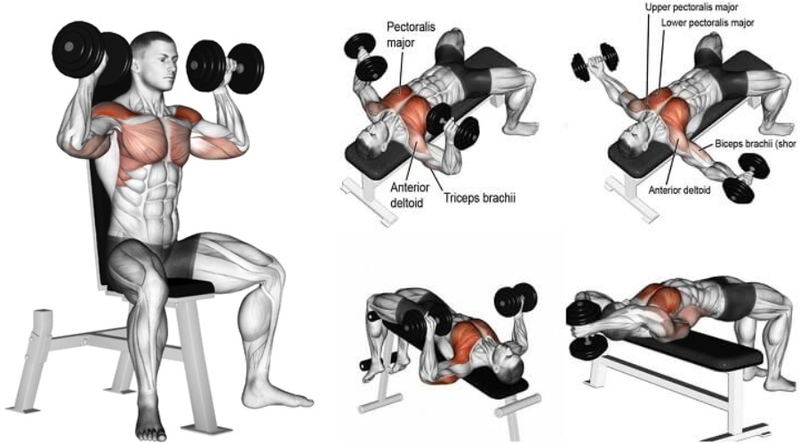 Return to the bench to build your triceps and further target your chest. It’s 15 reps, so you’ll need to work faster, but break the reps into chunks. With your hands on the bench and body outstretched, lock your arms out, then bend at your elbow to lower your upper arms until they’re parallel with the floor. Now, go back to the incline press.